It’s that time of year again. Lunch Box Season. And this time around you’re wondering what wholesome foods can you shove into your child’s lunch box without spending too much cash or time in the kitchen! I know the feeling and I opted to create a menu of lunch ideas complete with a main dish, veggie, fruit, beverage, and snack to make planning simple for you. 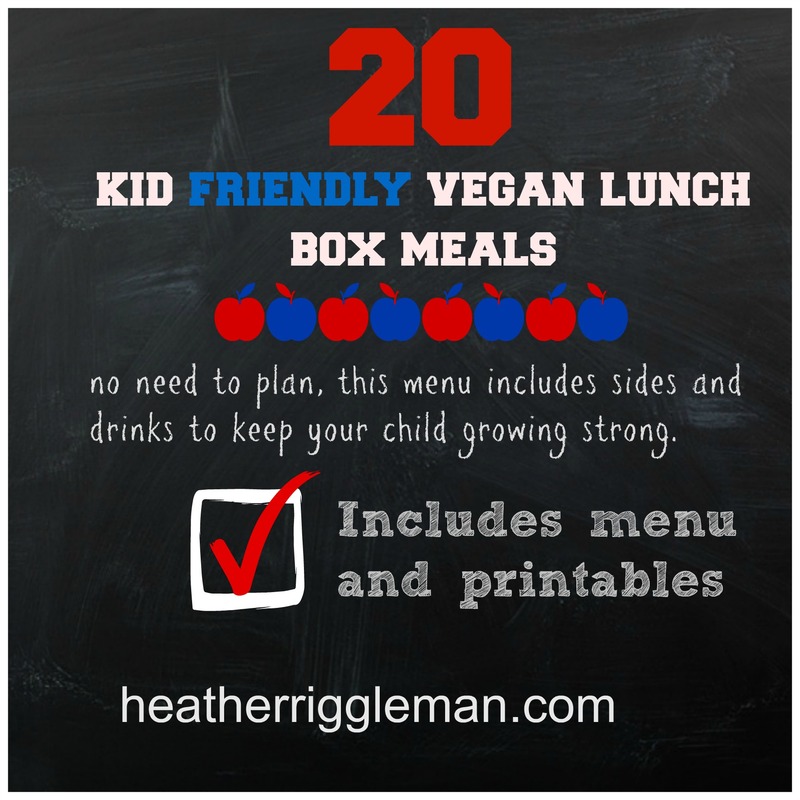 Below are 20 lunchbox meals that my kids will be eating this year. After experimenting with organic foods and cutting out hormones, antibiotics, sugar,s and preservatives, we opted for a vegan free lifestyle. Although you can probably call us Flexitarians as we have been known to have seafood on a rare occasion. However, even if you aren’t vegan, these recipes and ideas can be adapted to your family’s diet. We’ve seen the health benefits and the tremendous improvement in reducing side affects from Aspergers and ADHD & ASD, but I digress; below are 20 ideas with links to recipes or tips to make certain meals. Another thought to keep in mind as you plan your child’s meals, with the invention of thermos and icepack, you can save big bucks by cooking meals like Lentil Spaghetti for supper one evening and then using it has a meal for your child’s lunch box. Simply heat it up and place in a thermos. This opens doors for soups, hot dogs, chili, pastas and more. If you would like a printable version: Vegan Lunchbox Ideas for Kids. * Cook couscous with organic veggie broth instead of water, add peas. It tastes great served warm or cold. *For the wraps, I use whatever wrap or tortillas I have on hand and either make my own humus from scratch or use store-bought. Simple and easy. Either place humus in a separate container or spread onto wrap, roll and slice into pinwheels. ***DON’T FORGET TO ENTER INTO THE TARGET GIFTCARD GIVEAWAY. What to buy organic plus printables!